As I mentioned in last week's Menu Plan Monday, in an effort to save money, I decided to do a Pantry/Freezer Challenge. We have a really full pantry and partially full freezer, so it really isn't too bad. I am allowing us to pick up things as we NEED them. But only if we really need them. Things like milk, bread, fresh fruit and veggies are on the list of things we can purchase during the challenge. Of course, diapers and dog food are on that list, too. I'll also allow one or two ingredients that are needed to finish a recipe if I can't substitute with something on hand. Monday: Fried Spaghetti. I didn't add this to the list last week. Mainly because Joe mentioned that he wanted to take the spaghetti for lunch. He called me that morning saying since he forgot it, that I should just fry it up for dinner. 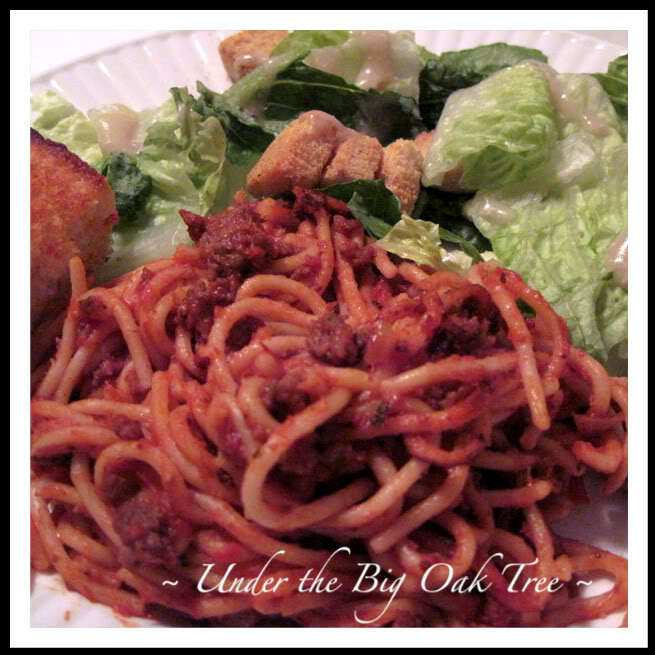 Since I love fried spaghetti, I didn't have a problem with that! 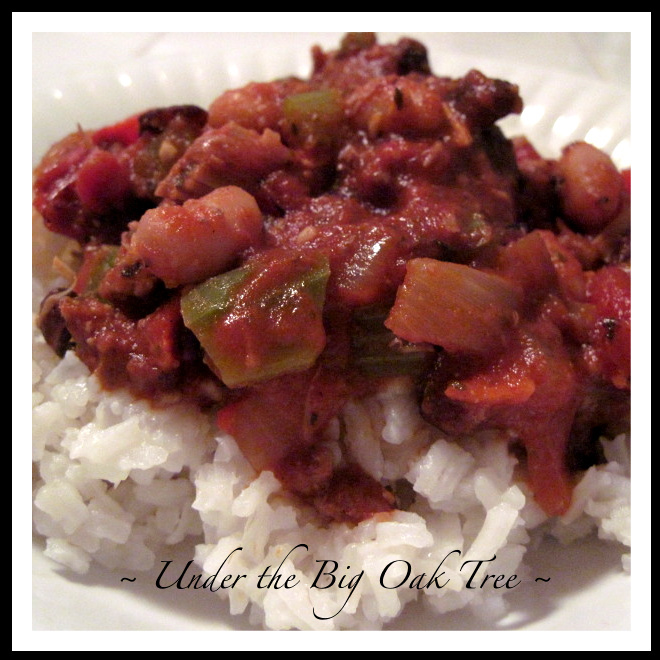 Tuesday: Chipotle Turkey Chili. I started the project of cleaning out my kitchen cabinets and drawers on Tuesday. By the time I looked up at the clock, I was no where near being finished with my organizing AND it was too late to throw something together for dinner. While I was looking for the bag of frozen chicken nuggets that usually saves me in situations like this, I spotted a foil container in the back of my upstairs freezer (the foil containers full of leftovers I usually keep in the downstairs freezer). I checked the label and was thrilled to see that we had some Chipotle Turkey Chili. The last of bit leftover from that last batch I made in April. I dumped the frozen block of chili into a glass baking dish and thawed it in the microwave while I made some quick-cooking rice on the stove. The quickest, tastiest meal we've had in a while! 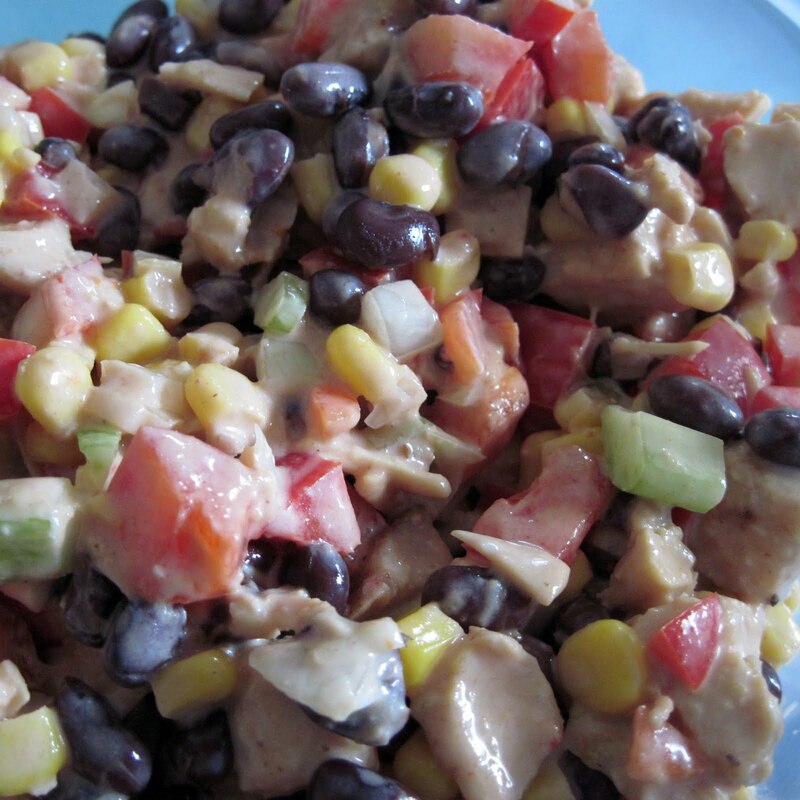 Wednesday: Barbecue Turkey Salad. Using leftover turkey breast, I whipped together a delicious turkey salad. I followed the recipe for Barbecue Chicken Salad. I used Fiesta Corn and also added some black beans for someting a bit heartier. Thursday: Leftover night. Gotta love leftover night! This was a true Leftover Buffet or clean-out-the-fridge night! Friday: Pizza. Friday was not a good day. I had a severe headache for most of the week and Friday was the worst. After running errands in the morning and mid-afternoon, I had no energy or desire to cook dinner and we finished up the leftovers the night before. I took Joe up on his offer to pick up a pizza on his way home from work. Saturday: Santa Fe Spaghetti Squash Casserole. This is the second time I'm making this recipe that I found over at Debbi Does Dinner Healthy and Low Calorie. As always, I've made a few changes. I'll post my version later today. 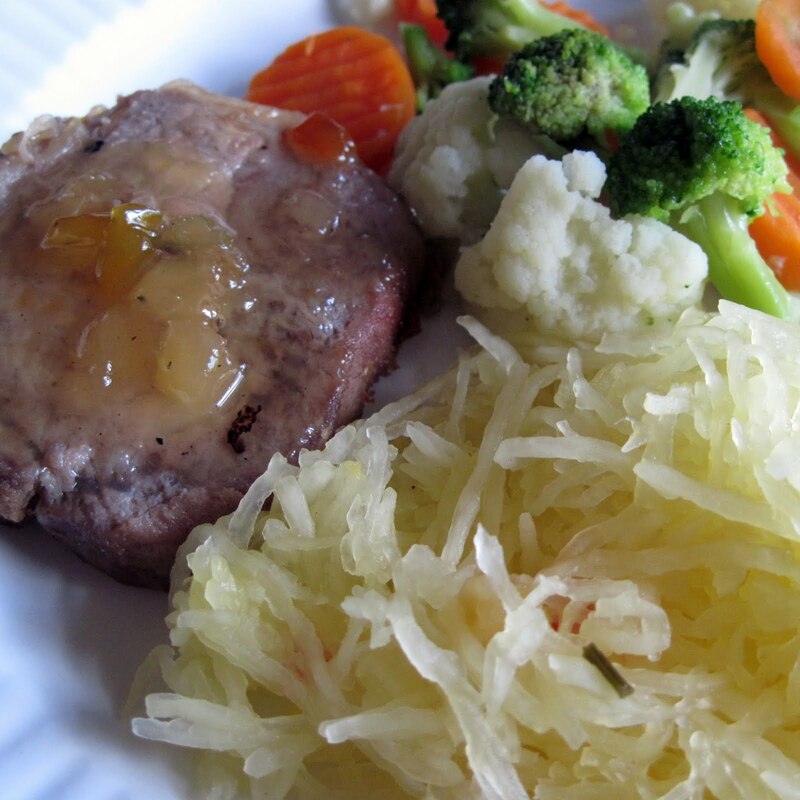 Sunday: Pork Chops, Spaghetti Squash, steamed veggies. I love spaghetti squash served alongside of pork. Since there was half of a squash left from Saturday, I dug a pack of pork chops out of the freezer and popped into the rotisserie oven with some really yummy sauce (review and giveaway to post this week). I haven't completely worked out my menu plan for this week but I will be continuing with my Pantry/Freezer Challenge. I've found a few other recipes that I'd like to try, but for the most part, I'll be working from the list of possible meals that I posted last week. Are you looking for more recipes or menu planning inspiration? If so, be sure to check out Menu Plan Monday each week over at I'm an Organizing Junkie! This week, Finding Joy in My Kitchen is helping Laura out by hosting Menu Plan Monday. Your recipes from last week all look really great! Thanks for sharing this with us today. Mmmm, the Barbecue Turkey Salad and the Santa Fe Spaghetti Squash both look so yummie. Unfortunately, I wouldn't know where to get spaghetti sqaush here in Belgium. I might put them on the list of things to try to grow myself. All the food looks delicious! I will definitely be trying a few recipes. A tip for the headache.. I use those cover your eyes-goggles that you freeze in the freezer and wear them backwards. I know it sounds odd but ice on the base of your skull can really help relieve a headache. I hope this helps and hope next week is pain free. Happy Wordless Wednesday! Oh my, YUM!!! 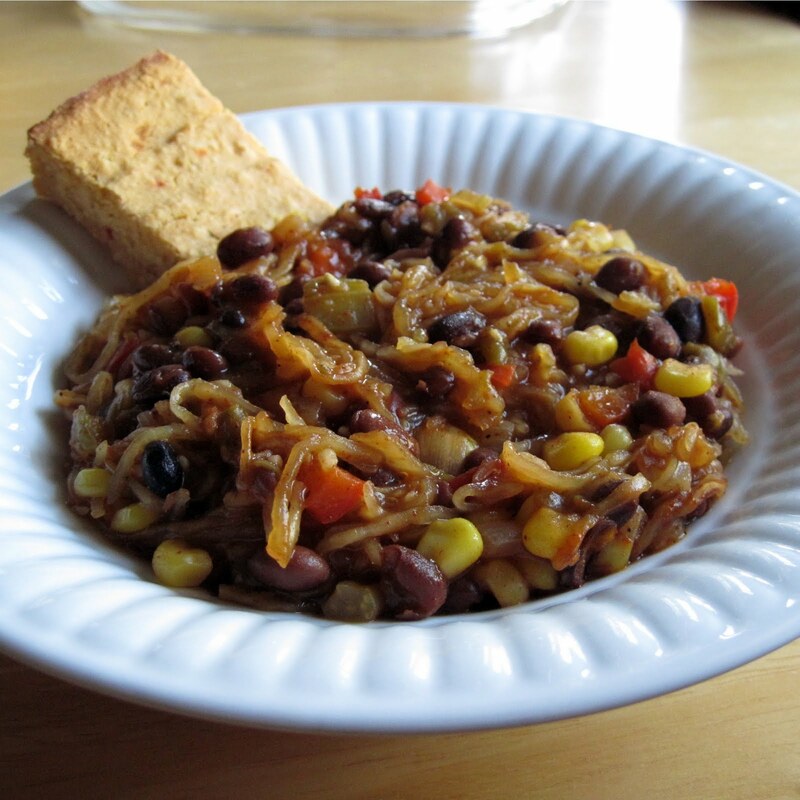 Those look delish, especially the turkey chili! Your blog is AWESOME!